The AstiPure™ PFA Bellows Pump range from Saint-Gobain are manufactured from high purity PFA and PTFE and are suitable for pumping even the most corrosive concentrated chemicals (acids and solvents). Offering flow rates from 15 litres/min up to 100 litres/min, their pumping frequency is much lower than an equivalent diaphragm pump and results in an extended life. Due to this low frequency and amplitude of the PFA bellows pump, we guarantee a lower level of particle contamination. 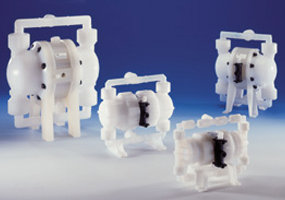 The PFA Bellows Pump is pneumatically operated with two horizontally opposed, reciprocating PTFE bellows. All other components are manufactured with high technology materials; e.g. PVDF and PEEK, and ensure no ionic contamination of the chemical. The product carries a 2-year factory warranty on chemical applications. With the option to extend an additional two years up to a maximum of 6 years total warranty, offering superior system up-time and significantly reducing cost of ownership. To further discuss the PFA Bellows Pump, and how we can help you to find the perfect solution to keep your process under control. Please contact us, or request a callback at a convenient time to suit you.